Welcome to today's edition of /jurassic-world-prank-game-thrones-lord-rings-debate/Nerd Alert, where we have all the off-beat, nerdy news for you in one convenient spot. What do we have in store for you on this wondrous Wednesday? Kristen Bell and friends dressed up to watch the Game of Thrones finale last weekend, Aaron Paul pulled off a Breaking Bad prank, and find out how Avengers: Age of Ultron "should have ended." So, sit back, relax, and check out all that today's Nerd Alert has to offer. 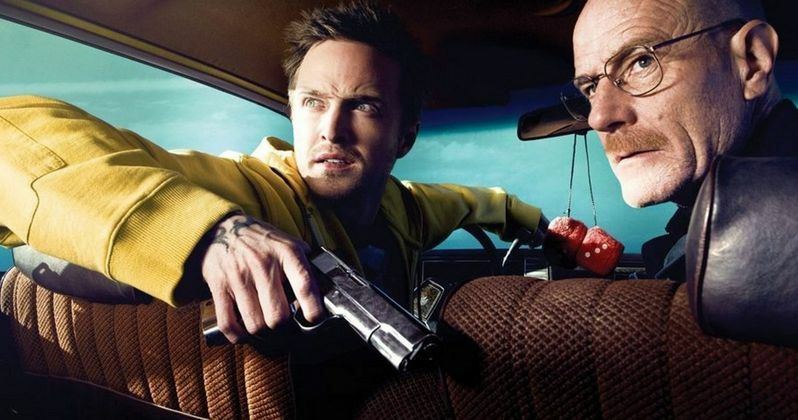 On Monday night, Aaron Paul announced a top-secret project on Periscope, revealing a Breaking Bad spinoff that follows his character Jesse Pinkman in Alaska, where many fans assumed he fled to after the epic series finale. While the actor's Twitter feed was littered with congratulatory messages, he ended up spilling the beans shortly thereafter, admitting that none of it was true. This lead to several inflammatory messages. In an effort to make it up to fans, he invited those in the Boston area, where he is currently shooting Central Intelligence, to come see Mad Max: Fury Road with him, naming the theater and the time of showing. Unfortunately, the video where he made the announcement is very choppy and cuts out his actual announcement, but at least Aaron Paul admitted right away that it was a prank. Sorry for the joke everybody. I love you all so much. Hugs and kisses. Mad Max??? Come watch it with me and all of my Boston friends at Regal cinemas near Fenway. 10:40 showing!! Hope you can make it boston. With Pixar's Inside Out opening this weekend, and Toy Story 4 in development for a 2017 release, Screen Junkies revisits the original Toy Story with their latest Honest Trailer. This one cuts deep, delving into existential questions about these toys and themes fans will revisit when they have kids, along with a surprise appearance from Will Sasso, who does a great Randy Newman impression with a spoof version of "You've Got a Friend in Me." The Game of Thrones Season 5 Finale had everyone on pins and needles before it aired Sunday night. Some celebrity fans were so excited that they decided to dress up as characters from the show for a viewing party. Kristen Bell sent out a photo from her Twitter account on Sunday where she dressed up as Lady Olenna Tyrell, along with Ryan Hansen as Samwell Tarly, Robert Buckley as a raven and a few more unidentified friends as another raven, a baby-toting Gilly (Hannah Murray) and a direwolf. Kristen Bell wasn't too pleased with the outcome of the finale, though. Earlier this month, the fine folks at How It Should Have Ended put together a clever animated video that showed how Avengers: Age of Ultron should have ended, which we featured here on Nerd Alert. Yesterday, they posted the second part of his hilarious parody, which pokes fun at the discarded Thor reflecting pool subplot, the actual Marvel parentage of Quicksilver and Scarlet Witch, the similarities between Vision and Superman and even the upcoming Captain America: Civil War and Batman v Superman: Dawn of Justice. We have both the first and second parts of this hilarious spoof above. Even though Marvel Studios won't have a Comic Con panel this year, the studio will still have a presence in other areas, with Hasbro debuting an Ant-Man figurine that stays true to the comic book adaptation's miniscule nature: the 0.75 inch toy is literally smaller than a penny. The collectable will cost $9.99 and will be available at Comic Con next month, but for those who won't be in San Diego, there will be limited quantities available after the convention on HasbroToyShop.com. Hasbro is also unveiling more conventional figurines with Scott Lang, Hank Pym, Giant Man and Goliath, which will each be priced at $64.99. Regular viewers of TBS' Conan know that one of Conan O'Brien's regular segments is Clueless Gamer, where he tests out and reviews an upcoming video game, despite having very little gaming experience. Earlier this week, Conan O'Brien hosted the first ever Clueless Gamer team edition, where the talk show host teamed up with Andy Richter and Clueless Gamer regular Aaron Bleyaert to take on Silicon Valley stars Thomas Middleditch, T.J. Miller and Zach Woods. The result is hilariously lopsided, with Team Conan still failing even after Team Silicon Valley literally announced where their players are. What's Nerdier? Star Trek or Star Wars? College Humor has put together a clever three-minute animated video that argues the nerd merits of both Star Trek and Star Wars. The video shows Darth Vader and the Death Star pulling the U.S.S. Enterprise into their tractor beam, and what ensues is a humorous back-and-forth about which franchise is better. The debate surely isn't settled by this video, but it provides some humorous food for thought. Pizza Hut has unveiled a new pizza box that can also double as a movie projector, giving fans a unique combination of "dinner and a movie" that has never been seen before. Customers order a pizza in one of four special boxes, that comes with a QR code for a movie download and a special lens that fits in a pre-cut hole in the pizza box. Fans can then position their smart phone inside the box and project the movie anywhere they please. Unfortunately, these boxes are only available in China for the moment, but hopefully it will come to the U.S. soon. That wraps it up for today's Nerd Alert. Do you have any suggestions for future Nerd Alert columns? Hit us up on Twitter @MovieWeb and send us your suggestions, and it may even make it in the next edition. Check back tomorrow for the next installment of Nerd Alert.